I love to travel, and I love to seek out experiences that maybe don’t involve the best judgment but always result in the best stories. Thailand is known as “The Land of Smiles,” and aside from the apathetic customs agent at the Bangkok airport who expressionlessly stamped our passports, the country seems to be living up to its name. According to the internet as well as several locals we’ve talked to, saving face is very important in Thailand. This means that Thais will smile not only when they’re happy but also when they’re seething inside at some affront from that damn tourist. And they’ll also smile when they’re ripping you off. My son and I are spending a month in northern Thailand, and we opted to take the overnight train from Bangkok to Chiang Mai, partly as a chance to see more of the countryside but also mainly because I like trains. This left us with about twelve hours to kill in the capital. We checked our luggage at the station, then ventured out to find some food and explore the neighborhood. Part of being a Westerner in a non-Western country means that you’re an easy mark. I’ve spent enough time in India to realize just how much pale-skinned people stick out, and also how lazy tourists are and how easily they make dumb decisions. Tuk-tuk drivers and travel guides have also realized this, and that results in Westerners being accosted by offers to take them places rather than letting them walk. As soon as my son and I stepped onto the sidewalk, a tuk-tuk driver approached us. Would we like a boat tour of Bangkok? Only two hours, and he would take us there, just 50 baht (about $1.50USD). I didn’t want to spend a whole day sitting at the train station, so off we went. Our driver was very friendly and chatty. He knew enough English to tell us about his young daughter, and that America meant freedom, smiling all the while. 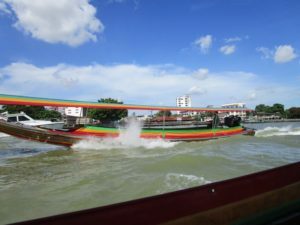 He delivered us to a boat company’s dock, where we paid a ridiculous amount to take a boat along the Chao Phraya River to the floating market, then to the Royal Palace, and then back to our starting point. Our driver emphasized, several times, that we would end up where we started. We climbed in our boat and headed out, our boat pilot (captain? driver?) delighting in hitting the wake so water sprayed in our faces. Several smaller boats approached us selling cheap crap — I mean handicrafts — and I bought a bottle of water from one just because the seller was so damn smilingly persistent. We stopped for lunch at a small market, then hopped back in the boat to go to the palace. We landed and paid a small dock fee, and then our pilot waved and sailed off. I tried to find out when and where he was coming back to pick us up, but all the smiling people conveniently didn’t understand my English. We eventually stumbled across a man with a similar racket to our tuk-tuk driver, who took us back to his tour organizer — who then tried to sell us a pricy one-way ticket back to our original location. My son and I were fuming. We’d either been blatantly lied to and ripped off, or we’d misunderstood our own tour organizer and this new person was trying to rip us off now too. Then add insult to injury that the palace charged admission of 500 baht per person, it was 90 degrees and sunny with 90% humidity, and we were jetlagged from traveling halfway around the world in the last 36 hours. Suffice to say, we were not happy campers. But then we stopped for a bit of perspective. The boat ride had been exhilarating, the market food was delicious, and we’d had the chance to see more of Bangkok than we would have had we stayed in the train station (especially when you add in the tuk-tuk ride we took back to the station). So we chalked it up to a stupid tourist learning experience and ended up enjoying the rest of our day. After all, we were in the land of smiles.